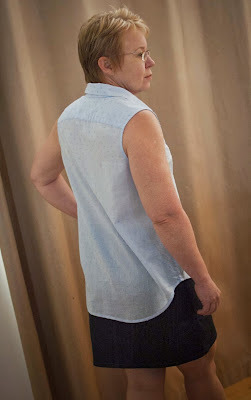 I did give you a preview of this top on Diana before sewing the buttons, but thought I would show it photographed on me, as even though I have made one of these tops before in a bamboo woven - here, this top falls a little differently due to the nature of the fabric. 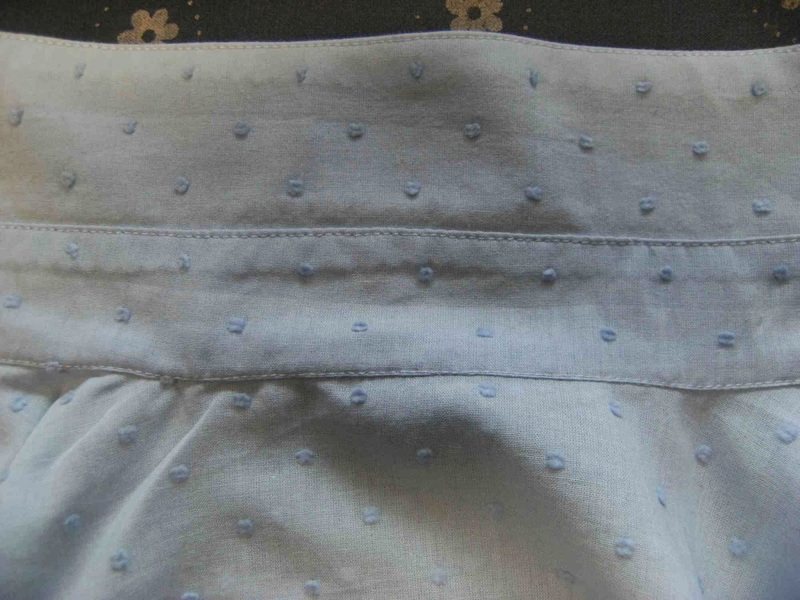 The fabric for this top was bought as a remnant piece from a designer's shop (Tengdahl) and is a beautiful swiss dot cotton voile. Lovely to work with and to wear. Sorry you can't see the detail of the fabric in these shots. And once again I managed to sew the collar and stand on using my edge stitch foot mainly. I would have hand-basted it to hold it while sewing but otherwise it is all sewn by machine. I mentioned this in the last post about the bamboo top, but didn't have a photo of the collar detail. You can see the detail of this lovely fabric. Two new tops I really love and which have gone into heavy rotation. Nothing amazing but I love this style of clothes and it really suits my lifestyle. Sue, this blouse style is lovely and as you say perfect for an Aussie summer, especially in the Swiss dot cotton voile. A great top for the coming summer, Sue. It is so hard to find a nice cool cotton top in the shops this year. Alas I don't possess your sewing skills!! This looks like a great summer staple Sue. Beautiful job on the collar and stand - looks like a perfect summer top. Very nice job on the collar! Looks like this top will be lovely to wear this summer. Very pretty summer top and love the fabric, and a cool cotton top will be perfect for summer.